A piezo-“sandwich”, consisting of two piezo elements in one housing, is stuck under one of the wings of the bridge. The four 3/4″ diameter piezo elements are attached to the bridge, one element underneath each string, with double sided adhesive tape. The Golden Trinity Microphone is mounted on the bridge using adhesive 3M Dual Lock and positioned using its built-in six-inch goosneck. With a K+K Dual Channel Preamp, you can use it along with your piezo pickup. I tried the Bass Max system and never could get any decent sound on any of my 2 basses, even with the help of professional sound engineers. It was the worst pickup I have ever tried. What was wrong/bad about it? how do performers use that instrument? Not successful also on my bass. Far from natural sound. I have one of the Bass Max pickups that tucks into the wing of the bridge. I got good sound only after equalizing the signal through a Fishman pro pre-amp. But, I often had troubles with feedback, especially when playing jazz pizzicato in basement clubs. And in those basement clubs, the pickup made the bass boom. I lost the string definition. Terrible. Inaccurate in response and sound. Cheap in quality. Needs heavy EQing to get a decent, yet still inaccurate sound. 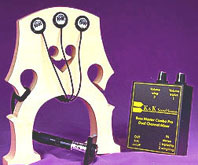 With a good sounding bass and quality amplification the K&K has sounded very good. With correct input impedance matching it needs no outboard preamp and has required very little eq adjustment. From clubs to festivals and concert halls, playing rock, salsa, R&B, musical theater, big band and jazz, feedback has not been a problem. It is ruggedly built; durable enough to be taken on and off the bass time and again for many hundreds of gigs over a fifteen year period. I own the double big twin. Aside from feedback issues (which can be fixed with proper amp placement, and eq), I’ve gotten a fairly true sound from my bass… The main thing is that it requires some serious eq’ing on the player’s part to get a good sound. If you don’t have the knowledge, you’re gonna have a hard time. I just cannot understand why you were unable to get a “decent sound” out of your BassMax! I have used one for 12 years with an LR Baggs Para Acoustic DI/Pre-amp and also the Fishman Platinum ProEQ preamp. I have used it on the different basses in the past 12 years. I have heard it from out front many times and with very little EQ correction it sounds very much like the bass is when unamplified. No string noise. No hollowness. No thin sound. It’s very full. I have recorded with it several times and its sounds very much like my upright bass. Not exactly the same but no pickup can do that. I also have a Revolution Solo pickup which also sounds very good. There is not a lot of difference between that and the Bassmax but there are some differences. But to choose one over the other would only mean am individual preference. Each pickup does a very good job. The only pickup I really disliked was the original Fishman but it was still useable. I also can’t believe different basses can make a huge difference in what is an acceptable sound. Most pickups I have heard sound fine…so it just boils down to personal preference. Did you sent the pickup back to be checked out? Did you use an appropriate pre-amp? Was the Bassmax installed properly? I realize it’s been a couple of years since you posted but I think you needed to say what exactly was was wrong with the sound of the Bassmax and what other pickups you tried before. I have no connection with K and K or any dealer but I can’t believe the pickup is as bad as you say. Hope you managed to find one you liked. Just wanted to add that the K&K is a bit rough for arco playing. Backing off the volume using an ab switch between inputs/channels while bowing helps a lot. Another thought about the K&K Bass Max. It is a high output pick up. On some amplifiers, the GK 150s for instance, it requires padding the input to prevent distortion.